Ecuador’s highest peak, Volcan Chimborazo (20,700 feet), is covered with finger-shaped glaciers that are retreating, possibly due to climate change. Research conducted in the Tropical Andes shows that temperatures are warming and humidity patterns are changing. Both factors influence the melting rate of glaciers and are indicative of climate change, scientists say. Jeff LaFrenierre, a geography PhD student at Ohio State University, says photographs of Chimborazo’s glaciers reveal “noticeable retreat” over the past decade. 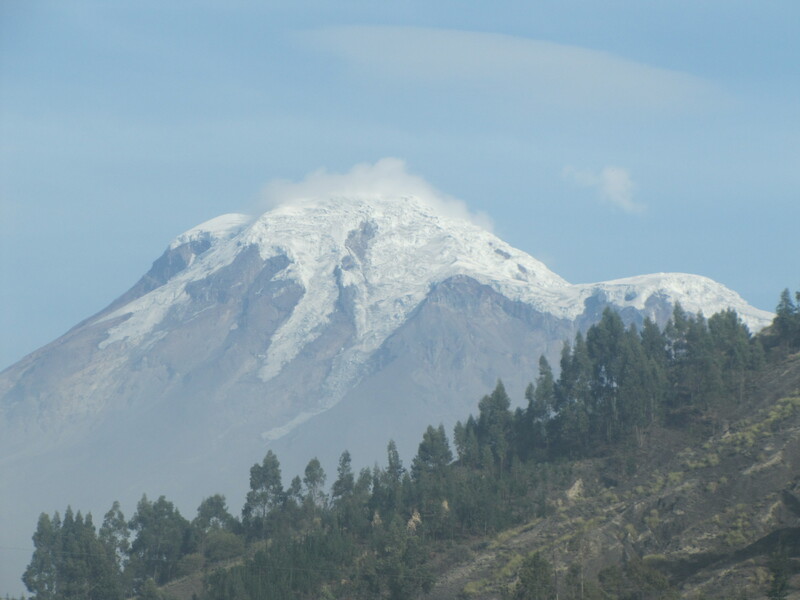 LaFrenierre, who is connected with the university’s Byrd Polar Research Center, is conducting research on Chimborazo. For his proposed PhD dissertation, LaFrenierre is studying how the volcano’s glaciers contribute to the region’s water supply. He wants to know if and how further reduction of Chimborazo’s glacial mass could impact this water supply. “Glaciers store excess snow and release it as meltwater during periods when it is warm or dry,” he said. As glaciers retreat, they initially release more meltwater but eventually the flow decreases. The glaciers of the Cordillerra Blanca in Peru and the Himalayas of India and Pakistan are known to be major feeders of water systems that supply millions of people with drinking water. If retreating glaciers deplete these water supplies, there are fears that so-called “water wars” will erupt in the future. “These are very preliminary concerns raised in other parts of the world and my objective is to see what the situation may be here on Chimborazo,” said LaFrenierre, who became familiar with the volcano while working with Engineers Without Borders. For my part, I made a recent visit to Chimborazo, a dormant volcano that lies in the Cordillera Occidental of the Andes of central Ecuador. My ears popped as we drove up the cloud-covered volcano passing through different ecosystems, including the paramo, or high-altitude grasslands, and the arenal, a high-altitude plateau littered with volcanic debris. I exited the truck at Carrel Hut, which stands at 15,900 feet. Initially I felt great taking in the silence of the vast landscape and sipping the fresh air. Yet just a few steps into my hike, I could feel the effects of the high altitude in my labored breathing and starry vision, both reminiscent of my experience hiking the Inca Trail in Peru. I continued up the trail for another 20 minutes, peaking a good distance from Whymper Hut (16,400 feet). The hut is used by serious climbers, who must rest before beginning their 12 a.m. ascent of Chimborazo. The early departure helps climbers avoid slipping on wet snow during the heat of midday. Limited visibility from the truck. Gracias, Becky — me interesa mucho el “posting.” Has investigado esta polemico de Ecuador, Colombia y Peru?